Recognizing personal tendencies and developing literary talents enabled Mary Flannery O’Connor to don multiple masks, concealing or revealing segments of herself as she desired. With no memoirs or lengthy autobiographies, O’Connor’s published works, letters, and manuscripts, along with previously unpublished letters, are examined to determine how O’Connor defined herself, not just how scholars interpret her life and works. In fact, the plethora of criticism is in danger of obscuring the most important authority: O’Connor herself. Carl Jung claimed that adopted personas allow people ways to conform to society acceptably. While O’Connor’s personal and social masks were affected by her Southern and Catholic roots, her vivid imagination and artistry fashioned her literary masks, allowing her to explore life’s grotesqueness. Some of O’Connor’s literary characters shelter self-defining features of her own personality and purpose. O’Connor’s masks serve as metaphorical embodiments of her veiled autobiography, illuminating key components of her sense of self and of her literary power. Sharp’s exploration of these society-obligatory and self-imposed masks identifies O’Connor’s goals, struggles, and successes; her critical insight into her own literature; her reaction and responses to family, friends, and acquaintances; and, ultimately, her own success and growth. Jolly Kay Sharp keenly examines how O’Connor shifts her perspective according to influences, relationships, and her personal journey. O’Connor’s maturation as an artist is thoughtfully considered as Sharp reveals the depth and complexity of this great writer’s craft. Flannery O'Connor is a mystery, and Jolly Kay Sharp clearly demonstrates that there are many Flannery O'Connors. For all her firmly held convictions, O'Connor displays different selves through-while also hiding behind-a variety of such grotesque alter egos as Enoch Emery, Rufus Johnson, and Hulga/Joy Hopewell. Sharp entertainingly reveals O'Connor to be more religious, more southern, more intellectual and individualistic than O'Connor wanted us, at least at first, to realize. Every reader of Flannery O'Connor has an opinion about her work. 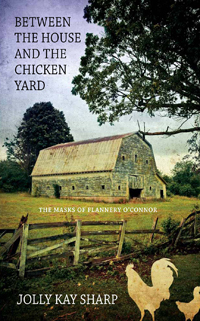 In “Between the House and the Chicken Yard”: The Masks of Mary Flannery O'Connor, Jolly Sharp takes the reader behind the Jungian masks O'Connor freely but intentionally uses with such personalities as Hulga and Haze among others. Each masked character clarifies a personality trait O'Connor brings to each page. With Sharp's study in hand, every O'Connor reader will go behind O'Connor's many masks and see who she really was. Scholars have focused on the ways in which Flannery O'Connor was mentored by Caroline Gordon and other writers, but Jolly Sharp is the first to give sustained attention to the ways in which O'Connor herself took on the role of mentor. Drawing from a wealth of previously unpublished materials, Sharp deftly explores the many masks that O'Connor appropriated in her letters and essays-and in the more famous fiction that has made her one of the nation's most celebrated writers.